Extreame Savings Item! Free Shipping Included! 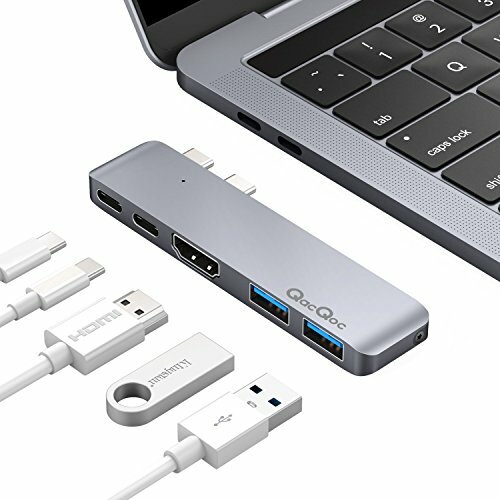 Save 44% on the QacQoc USB C Hub, Type C Adapter 40Gbps Thunderbolt 3,4K@30Hz HDMI,Type C Data Transfer 2 USB 3.0,GN28A4 Aluminum Dongle Compatible with 2016/2017 MacBook Pro 13'' 15''(Gray) by QacQoc at Andy Pemberton. MPN: GN28A4-Gray-Q. Hurry! Limited time offer. Offer valid only while supplies last. Expand to multiple ports Plug & Play with 1 x 40Gbps Thunderbolt 3, 1 x usb 3.1 type c port(transfer data), 2 x USB 3.0 Ports, 1 x 4K@30Hz HDMI port. Plug & Play with 1 x 40Gbps Thunderbolt 3, 1 x usb 3.1 type c port(transfer data), 2 x USB 3.0 Ports, 1 x 4K@30Hz HDMI port. Built with the USB Power Delivery Specification, this enables full-speed MacBook Pro(2016/2017) recharging while simultaneously connected to Superspeed USB 3.1 & HDMI-enabled devices. This hub transfers data over USB at incredible speeds. That's fast enough to transfer a high-definition movie from max 2TB external hard disk in seconds. A sleek minimalist design with an aluminum-alloy finish perfectly complements the new 13" 15" MacBook 2016/2017. The hub's two USB ports have a combined output of 1.5A, devices which need a higher currency may not support, such as Apple SuperDrive (start up currency is 2A at least). The working temperature of charging chipset is about 40℃.  [Unique Design] Specially designed for New 13" 15" MacBook Pro 2016/2017,brushed aluminum design compliments Apple accessories,the compact and easy-to-use design makes it simple to take this Type-C USB Hub with you anywhere. [High Speed Μltiple ports]Features 1x Thunderbolt 3 USB-C port, 1x USB-C Data Port, 2x USB-3.0, 1x HDMI (4K @ 30Hz).Thunderbolt 3 port supports pass-through charging and video output up to 5K.  [Strong Power Delivery] Support strong power input,Charging your laptop while connecting all supportable peripherals and transferring data & 900mA output per usb port which can perfectly operating max 2TB external usb driver. If you have any questions about this product by QacQoc, contact us by completing and submitting the form below. If you are looking for a specif part number, please include it with your message.